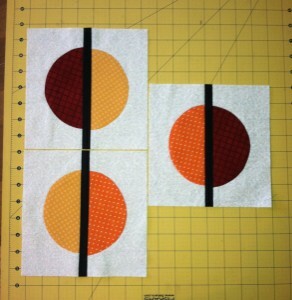 I don’t trust my machine applique ability so these were hand sewn down. Then I watched the videos posted that made it look easy. I don’t know if I will get more done or not. The maroon is a problem here too…don’t have a whole lot of it. So 3 is the number for now. The great thing is that however we are making the beads, the blocks are coming out all the same. If you decide to make more, you can use the same maroon, combined with different yellow and orange.